A package arrived in the mail a few weeks ago from Lois Bliss Herbine, the Philadelphia-based flute and (especially) piccolo player. The envelope contained two items. The first was a 2014 CD entitled Inverno Azul (that’s Blue Winter) containing nine chamber works for flutes(s) written by Temple University flutist and composer Cynthia Folio. There’s music for flute alone, one or two flutes and piano—Charles Abramovic is the dependable accompanist—flute quartet/choir and a jazz quintet with flute and trumpet as the “front line.” A high point of the disc is Philadelphia Portraits: A Spiritual Journey, a five-movement work commissioned by Herbine for piccolo and piano. Each movement touches, musically, on the essence of five renowned Philadelphians—composer Vincent Persichetti, jazz great John Coltrane, the singer and civil rights pioneer Marian Anderson, inventor/statesman Benjamin Franklin, and the nation’s best-known seamstress, Betsy Ross. Folio’s miniatures nail the essential character of their subjects to a remarkable degree and Herbine’s robustly expressive and subtly colored performance seals the deal. 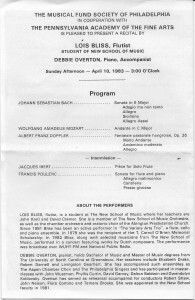 Also in the envelope was a photocopy of the program for a nearly 33 year old recital performed at the Pennsylvania Academy of the Fine Arts. The soloist was a young flute student at the New School of Music named Lois Bliss. The concert of Bach, Mozart, Doppler, Ibert, and Poulenc was presented by….The Musical Fund Society of Philadelphia, who sponsored a contest won by Bliss, still a college student at the time. The artist describes it today as “an important step for me” in terms of her professional development. MFS’s support of young musicians, of course, remains a critical part of the organization’s mission. Good to see that our instincts of three decades ago were proven right! Inverno Azul, on the Boyer School of Music and Dance label (BCM+D Records) is available on CD from Amazon, and as a download from Amazon and iTunes. Thanks for the great review! I am a proud member of the Musical Fund Society! Thank you so much for your past and present support! Copyright (c) The Musical Fund Society of Philadelphia.